Father of under attack afternoon talk show host on Neat FM, has corroborated accusation by his son, Adakabre Frimpong Manso, that he has on a number of occasions been verbally attacked by the flagbearer of the New Patriotic Party (NPP), Nana Akufo-Addo. Robert Okyere Frimpong Manso, speaking from his base in Kumasi in the Ashanti Region, disclosed that he wanted to hold a press conference to reveal all that Nana Akufo-Addo had been doing to his beloved son; threatening to end his broadcasting career. He revealed an earlier letter written to the management of the Despite Group of Companies by Nana Akufo-Addo, and the NPP, complaining about his son; obviously inciting management of the company to sack him. The man popularly called, R.O. Frimpong Manso, disclosed how he defiantly confronted Nana Akufo-Addo at a funeral in Kumasi in the presence of Dr. Owusu Afriyie Akoto, the NPP Member of Parliament (MP) for Kwadaso Constituency, asking him to leave his son alone, because as he put it “Adakabre had told me all that has been happening”. The second incident happened in Tamale in the presence of the widow of the late Alhaji Aliu Mahama, Hajia Ramatu, ex-NPP MP, Frema Opare, Dr. Mahamudu Bawumia, Bugri Naabu, Titus Glover, Osei Kyei Mensah Bonsu, Hackman Owusu Agyeman, Henry Quartey and Kofi Duah and Kwesi Agyeman. The first attack had taken place at his Nima residence in the presence of Herbert Krampah and one Asiamah, an NPP elder with Gabby Asare-Otchere Darko and Nana Akomea, later summoned on the same day to mediate for amicable settlement. In a telephone interview with The Herald, R.O. Frimpong Manso, said he had planned to hold a press conference on Monday to expose the 72-year-old three-time flagbearer, but he had been prevailed upon by his son for peaceful co-existence, however, the incessant politically-motivated verbal attacks, have left him with no choice, than to let the public know what is happening. 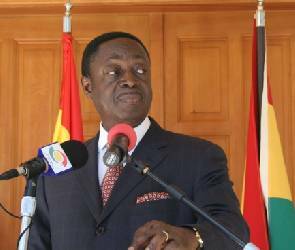 “In fact, if not that Adakabre has stopped me….but I am watching, will come out and reveal all that Akufo Addo has done against my son. I will do it, because me, he [Akufo Addo] can’t diminish me, I am a pensioner”. The 78-year old man, who traces his political history from Ghana’s first president, Osagyefo Dr. Kwame Nkrumah, said he has been worried about Nana Addo’s behaviour towards his son to the extent that last year, he had the cause to “appeal to his conscience” to desist from disturbing his son at a funeral in Kumasi. Speaking to this paper yesterday on the heels of a barrage of attacks and accusations directed at his son by the largest opposition party, spurred by a press statement from a deputy communications director, Anthony Karbo, R.O. Frimpong Manso said, “It wasn’t confrontation but I was appealing to his conscience last year to stop intimidating my son”. But the NPP flagbearer in a response told him “Then talk to your son he is destroying my name”. According to him, after his encounter with Nana Addo, he later learnt that it did not go down well with him and so he Nana Addo stormed out of the funeral grounds of Nana Osei at Nhyiaso, in anger as his investigation later confirmed. He explained to The Herald that his encounter with Nana Addo at the funeral grounds, was only to counsel the three times presidential candidate to have a big heart and stomach criticisms, as leadership is all about accepting divergent views. He said “as a leader, even in cases where your name is mentioned and it is unpalatable, you must accept it in good faith”. “I told him you are a political leader if your name is mentioned and even if it is bad, you must take it in your stride, you must have a big heart”, R.O. Frimpong Manso, expatiated. The onetime Director of State Protocol, said he was very concerned about the intimidating tactics being meted out to his son by Nana Addo and his men and warned “he should remember if he wants to disturb my son, I won’t agree. He should remember he (Adakabre) has a family. I am concerned about what Akufo-Addo is doing to my son”. 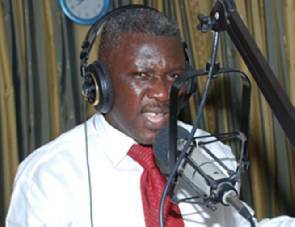 For unknown reason, Adakabre Frimpong Manso, could not be on his afternoon programme yesterday as loyal listeners who tuned in to listen to him, were shockingly treated with music. Perhaps hinting what is bound to happen in the coming days, Adakabre’s father said, all Nana Addo was seeking to do to his son was to get him out of the station, having hounded him from Adom FM few days after losing his (Adakabre) his beloved mother. Mr. Frimpong Manso, who revealed he spent years in exile in London, said he was amazed at Nana Addo’s quest to stoop so low as to chase out his son, who he insists has not done nothing wrong. To him, his son is only working hard to contribute his quota to the development of Ghana, and so did not understand why he will be targeted. The man, who revealed his ties to the Convention People’s Party (CPP) said “I attend CPP Council of Elders meetings” and served notice that “My son cannot be intimidated by Akufo-Addo”. Meanwhile, additional information dug out by The Herald revealed that the first attack on Adakabre Frimpong Manso’s by Nana Addo was in December 2011 at a press soiree at his residence at Nima, upon an invitation from Hebert Krampah, the then Press Secretary to the NPP flagbearer. Those who witnessed the incident mentioned that, Mr. Hebert Krampah, had called out Adakabre from amongst his colleague media persons to greet Nana Addo, but the NPP leader, flared up and went into tantrums, saying so many things like a baby. This bazaar incident happened in the presence of one Asiamah; an NPP Council of elders member from Cape Coast; Central Region. Also present to witness the embarrassing spectacle was Herbert Krampah. Gabby Asare Otchere Darko and Nana Akomea, later intervened in the situation, and settled the issue the same day after Herbert Krampah, had briefed them as to what Nana Addo, had done to him. Following the amicable resolution of that fracas, Nana Addo, impressed upon the seasoned radio host to help him in his campaign, but in his presence, he told him he could not do it, because his cousin is John Alan Kwadwo Kyeremanten, who was also contesting the NPP presidential candidate slot. The second incident happened in April 2014, at the NPP congress in Tamale, when the two met again in the residence of the late Vice President, Aliu Mahama. Nana Addo, was said to have come from the hospital where he and his entourage had gone to visit accident victims. Adakabre who wanted to show respect by greeting Nana Addo, was snubbed by him after which (Nana Addo) went into a verbal vitriolic attacks, threatening to deal with him. This incident also happened in the presence of the window of Aliu Mahama; Hajia Ramatu, Frema Opare, Dr. Mahamudu Bawumia, Bugri Naabu, in that order. “The fifth person in line was Nana Addo, who refused to extend his hand and started shouting abuses at him and ended up saying that Adakabre, should never mention his name on radio and that if he does, he will see”. So for about 90 seconds to 120 seconds, Adakabre, kept quiet then later proceeded to shake the hands of Osei Kyei Mensah Bonsu, Hackman Owusu Agyeman, then shook the hands of Titus Glover and then the last person being Henry Quartey. In Adakabre’s company was his producer, Kofi Duah and Akwesi Agyeman, who were all surprised. Later Nana Addo’s bodyguards, were threatening to deal with him. The issue worried the team that, they quickly called Fada Dickson in Accra to inform him about what had happened. The management of Despite Group of Companies, through Fada Dickson, wanted to pull Adakabre from the Tamale, but he refused, insisting he will stay to cover the congress. However, Adakabre, continued to receive life threatening messages, including one from a certain Augustus Jonah, dated March 11, 2014. Adakabre declined to speak with The Herald on the details of the threats, but said “there were several close relatives who were insisting that I should report to the police, but yet again I told myself “God will do it. The whole family is worried. At a point my family was putting pressure on me to stop this radio business”. He was, however, shocked at the utterance of the NPP Director of Communication, Nana Akomea, whom he had in one instance to tell his party and especially Nana Addo to “desist from abusing and threatening him , and made reference to these two incidents”. He was also shocked at Titus Glover, who had begged him not to go public with the incident inside Aliu Mahama’s residence.